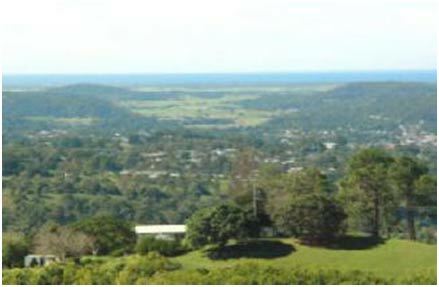 The major towns within the subcatchment are Nambour (pop 11 832) and Bli Bli. Nambour is the administrative centre of the old Maroochy Shire. The major land uses within the subcatchment are living space, grazing and cropping. Living space, both urban and rural residential, utilize less than 1000 ha of the subcatchment. The urban areas are concentrated mainly in Nambour and Bli Bli with the rural residential areas satellite from these. Grazing, both beef and dairy, is concentrated largely in the upper reaches of the subcatchment, where the soils are better and less prone to the effects of flood. This land use occupies slightly over 1000 Ha. 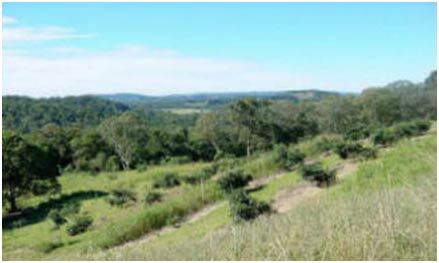 Part of the Maroochy River catchment, Petrie Creek rises in the steep slopes of the Blackall Ranges near the town of Hunchy, and confluences with the Maroochy River in it’s estuary upstream of Maroochydore. In the headwaters, the geology and landform is affected by the Tertiary Laterised Basalt of the Blackall Range, and the higher gradient of the creek bed. The drainage line is incised, with the slopes of the bounding hills being steeper. There are small, discontinuous valley flats along the channel boundaries. Downstream of Nambour, the creek drains at a low angle through Quaternary Alluvium of gravel, sand, silt and clay forming a level to slightly undulating floodplain bounded by steep low hills replacing the discontinuous valley flat system. Remnant vegetation covers nearly one third of the subcatchment. This is contained in State Forests, National Parks and remnant vegetation on private land. The types of remnant vegetation are closely linked to landform. The upper slopes and crests of the steep low hills largely support open forests of Blackbutt (Eucalyptus pilularis) and Grey Ironbark (Eucalyptus siderophloia), grading to Tallowwood (Eucalyptus microcorys) and Brush Box (Lophostemon confertus) forest, interspersed with pockets of gallery forest and palms sheltering in protected areas. This vegetation type becomes mixed with Red Bloodwood (Eucalyptus intermedia) in the upper subcatchment. The riparian zones in the upper catchment support areas of subtropical rainforest, whilst in the lower subcatchment the alluvial plain supports remnants of Melaleuca and Casuarina open forest. Near the confluence with the Maroochy River, there are several patches of remnant Grey Mangroves (Avicennia marina) inhabiting the creek margins. Cropping, including annual crops, semi permanent crops and sugar cane occupy about 1600 Ha in the subcatchment. Annual and semi-permanent crops are mostly concentrated on the slopes and valley flats of the upper catchment, in less flood prone areas. Sugar cane is grown exclusively on the wider alluvial plain of the lower catchment, near the confluence with the Maroochy estuary.